At its special media event last week, Apple led up to the introduction of the iPad mini and the fourth-generation iPad with not one, not two, but three new Mac models. The iMac received a new industrial design, a new 13-inch MacBook Pro with Retina Display entered the product line, and the Mac mini received a CPU upgrade. Interestingly, Apple Senior Vice President of Worldwide Marketing Phil Schiller claimed that the iMac is the best-selling desktop computer in the United States. Even more impressive, he said that the 13-inch MacBook Pro was both the best-selling notebook in the country and the top-selling Mac overall. That fascinates me, since although I’ve always liked the 13-inch form factor (and the 12-inch PowerBook before that), Apple has always seemed to put more emphasis on the 15-inch models. New iMac Gets Thinner — With the iMac, Schiller made a big fuss about how amazingly thin it is, tapering to only 5 mm at the edges and dropping in weight as well. Not surprisingly, that thin edge leaves no room for an optical drive (a USB-based SuperDrive is available separately), and although there is an SD card slot, it is now located on the back of the iMac, next to the other ports, where it will be rather difficult to access. 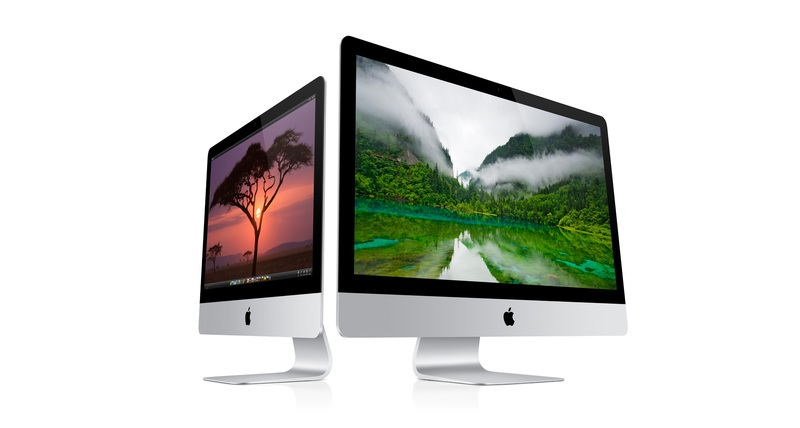 The iMac continues to be available in 21.5-inch and 27-inch models, and the screen resolutions have not changed from the previous generation’s 1920-by-1080 and 2560-by-1440 pixel counts. But they should look better, since Apple has now laminated the screen to the front glass, eliminating a thin air gap, and has used a plasma deposition process to put an anti-reflective coating on the display that reportedly reduces reflection by 75 percent. Those who have bemoaned Apple’s focus on glossy displays will undoubtedly appreciate this change. Topping it off, Schiller said that each display is individually calibrated coming off the manufacturing line. Performance should be good (though not necessarily that much better than the previous models), with a range of quad-core Intel Core i5 and i7 processors (speeds depending on the model and build-to-order choice), 8 GB of RAM by default, and support for up to either 16 GB (21.5-inch model, only at order) or 32 GB (27-inch model, via four user-accessible DIMM slots) of RAM. Storage also varies by model, with the smaller iMac coming with either a relatively slow 5400-rpm 1 TB hard drive or a 1 TB Fusion Drive (more on that in a moment), whereas the larger iMac offers a 7200-rpm 1 TB hard drive, a 3 TB hard drive, 768 GB of flash storage, or a 1 TB or 3 TB Fusion Drive. The Fusion Drive sounds quite neat — it combines 128 GB of flash storage with a 1 TB or 3 TB hard drive. OS X 10.8 Mountain Lion and Apple’s default apps live on the flash portion of the Fusion Drive by default, and Apple claims that Mountain Lion intelligently moves frequently used applications and documents to the flash portion of the drive. Hybrid drives of this sort aren’t new, but the Fusion Drive boasts much more flash storage (128 GB versus 16 or 32 GB) and custom support at the operating system level. Apple claimed that while flash storage is normally nearly four times faster than a hard drive, the Fusion Drive is only slightly slower than flash-only storage. How much more a Fusion Drive will cost isn’t yet known, but presumably it will be between a normal hard drive and flash storage. Other features include dual microphones and better stereo speakers, a FaceTime HD camera, headphone jack, SD card slot, four USB 3.0 ports, two Thunderbolt ports, and a Gigabit Ethernet jack. Wireless connectivity remains stable with 802.11n Wi-Fi and Bluetooth 4.0. Graphics are provided by a range of Nvidia GeForce GT graphics processors, starting with the 640M or 650M with 512 MB of GDDR5 memory in the smaller iMac, and going to the 660M with 512 MB of memory or the 675MX with 1 GB of memory in the larger model, with the 680MX with 2 GB of memory as an option. The price range remains essentially the same, with the entry-level 21.5-inch iMac starting at $1299, and the high-end 27-inch iMac at $1999. It’s unclear how the build-to-order options will affect the final prices, because these iMacs aren’t yet available and thus can’t be configured in the online Apple Store. The 21.5-inch model will ship in November 2012, Apple says, to be followed by the 27-inch model in December. As is often the case when Apple replaces a Mac model, it’s hard to say much bad about the new iMacs, apart from the loss of the SuperDrive, awkward positioning of the SD card slot, and the lack of user-accessible RAM in the 21.5-inch model. Otherwise, they look great, should have excellent performance, and cost basically the same as before. I can’t get as excited as Phil Schiller did about how thin and light the new models are, given that they’ll just sit quietly on your desk — we’re not talking about a MacBook Air here. The drop in weight is likely due mostly to eliminating the SuperDrive; also missing from the new 13-inch MacBook Pro are Gigabit Ethernet and FireWire, both of which can be added back with optional Thunderbolt adapters. Speaking of which, it has two Thunderbolt ports, two USB 3.0 ports, an HDMI port, an SDXC card slot, and a MagSafe 2 power jack. 802.11n Wi-Fi and Bluetooth 4.0 are standard. It has a beefier battery (74-watt-hour, up from 63.5-watt-hour) to power all those pixels, but Apple still claims the same “up to 7 hours wireless Web” battery life. On the performance side, you have the choice of a 2.5 GHz dual-core Intel Core i5 or a 2.9 GHz dual-core Intel Core i7, both with 8 GB of RAM. Although the online Apple Store implies there are two models, the only difference is the base amount of flash storage: 128 GB or 256 GB. You can also choose 512 GB or 768 GB of flash storage (for a lot more money), but the Fusion Drive from the new iMac is not an option. Graphics are courtesy of an Intel HD Graphics 4000, the same integrated graphics chip used by all other MacBooks (though the 15-inch models add discrete Nvidia GeForce GT 650M processors). The real question is how this new 13-inch MacBook Pro with Retina Display stacks up against both the old 13-inch MacBook Pro, which remains available, and the 13-inch MacBook Air, which is thinner and lighter, but slower and somewhat less customizable. The new model starts at a $500 price premium over the others. I would encourage those who are interested in one to look at the screen side-by-side with one of the less-expensive 13-inch MacBooks, since that’s the most significant difference, and you’ll want to make sure it’s worthwhile. 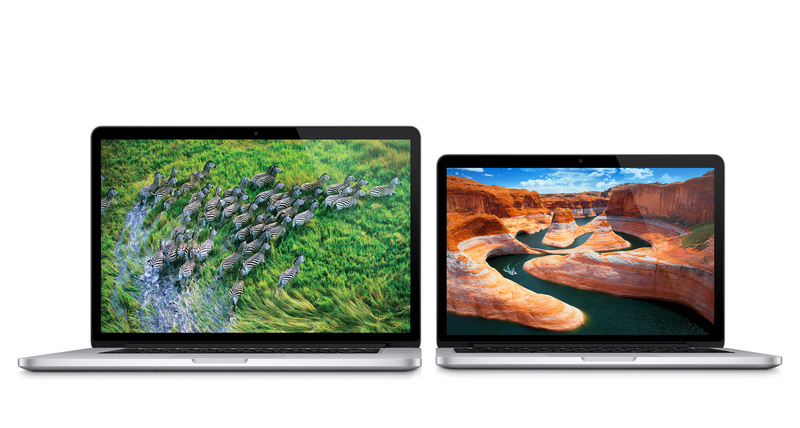 The new 13-inch MacBook Pro with Retina Display starts at $1699 and is available immediately. Mac mini Gains i7 CPU Option — Last, and definitely least, Apple upgraded the Mac mini with new CPUs, swapping the base 2.3 and 2.5 GHz dual-core Intel Core i5 CPUs (with an option for a 2.7 GHz dual-core Intel Core i7) for a 2.5 GHz dual-core i5 and a 2.3 GHz quad-core i7 at the base level, and offering a 2.6 GHz quad-core i7 as an option. Apple claims these new CPUs are up to twice as fast, and their integrated Intel HD Graphics 4000 processors are also up to 65 percent faster than the previous Intel HD Graphics 3000 processors. The main other changes I can find is that the Mac mini switches from USB 2.0 to USB 3.0 and comes standard with 4 GB of RAM that can be upgraded to 16 GB, up from a previous max of 8 GB. The $599 model comes with a 500 GB hard drive and its only option is for more RAM. In contrast, the $799 model comes with a 1 TB hard drive and offers options of more RAM, the 2.6 GHz quad-core i7 processor, a 1 TB Fusion Drive, and 256 GB solid-state drive. The new configurations are available immediately. As with the previous generation, the Mac mini lacks a SuperDrive, leaving only the 13-inch and 15-inch MacBook Pro and the Mac Pro with internal SuperDrives. A Burgeoning Product Line — We’ve come a long way since Steve Jobs hacked and slashed at Apple’s Mac line until there was a simple 2-by-2 matrix of consumer (iBook and iMac) and professional (PowerBook and Power Mac) models. Apple now sells ten different Mac models, and keeping them straight is becoming increasingly difficult. While writing this article, I found myself looking at the wrong specs several times, and even Apple now feels the need to provide comparison pages. There are two ways to look at this trend toward a larger product line. The glass-half-full camp would say that it is evidence of Apple’s increasing share of the market and overall position. As Apple attracts more users, it becomes more important to offer slightly different models to fit the needs of people who would otherwise turn away from a single model in any given category. That’s especially true in the laptop world, where most sales are these days, and where Apple now sells six different models. The glass-half-empty people would warn that the exact reason that Steve Jobs pared down the product line remains true: customer confusion. Apple has always prided itself on simplicity, but when three of ten models are 13-inch laptops, customers are being asked to make increasingly finely grained decisions. Plus, even for a company as large and powerful as Apple has become, maintaining focus on all these different products is difficult — witness the delayed ship dates for the new iMac models. Realistically, I don’t see the increasingly large product line causing significant problems for Apple in the near future. I mention it more as something to keep an eye on, because if the Mac product line were to jump to 50 models, that might be an indication that the company was losing its way. For now, we can just enjoy the fruits of Apple’s continually excellent hardware design. It seems to me that the iMac is becoming close to being a small appliance like a toaster. When it breaks, just toss it and buy another. Serviceability is more and more not a concern. I do think that miniaturization is completely at odds with serviceability and we're just going to see more of that. My main concern is how to remove the HD & SSD for privacy protection when disposing of a dead iMac (Late 2012). I don't see that as a major issue unless you're dealing with government-level secrets. The simple fact of the matter is that if you're that concerned about security, you're using FileVault 2 to encrypt the entire disk to start, and when you dispose of the Mac, you're going to use Disk Utility to do a multi-pass erase that writes zeroes to every block. That combination will meet the requirements of nearly any organization, and if it doesn't, they'll just destroy the entire computer. Apparently, configuring the new Mac Mini Server with a 256GB SSD removes BOTH of the 1TB hard drives. Nor can it be configured with the new Fusion drive. There seems to be no way to configure it with both an SSD and an HD, this is a severe restriction compared to the previous model. Also, comparing the Mini Server configurations with the $799 Mini configurations makes it seem that Apple is charging $100 for the OS X Server software, which is sold for $20 in the Mac App Store. I also use an outboard SSD 64 GB for a backup of system plus some data files. See no reason to upgrade to new mini. I'm an engineer, so I know something about technical design. The thinner a computer is, the more tightly packed the components, the hotter it will run, the more likely something will fail. This is just basic "laws of physics" stuff. In addition, the fact that they had to struggle with getting the "screen bonding" process to work is another indication that they're on the hairy edge of this thing failing (e.g. screen delaminating over time, air bubbles appearing, etc). Of course it looks cool, but let's face it, the older iMac looked extremely cool also (dare I say, "cool enough"?). By pushing the packaging envelope in this way, Apple has sacrificed reliability and robustness, just to go from "ridiculously thin" to "insanely thin". And who ultimately pays the price? We do -- either by having to pay for Apple Care to protect our failure-prone new toy, or (if we roll the dice) by very possibly having to replace it years before we should have had to. I would personally MUCH rather have an iMac that is less thin, has an optical drive, and will let me sleep at night not worrying that I'm "on the edge of failure" with my new toy. Plus, I look at my computer from the FRONT (doesn't everyone?) -- when will I ever even see how insanely thin it is, and when will I care?? I don't know if you've seen screen shots, from all angles, of the iMac but it's not as thin as people think. Yes, the edge of the screen is only 5mm but go have a look at the side view. It bulges like a tear drop design. It's like an illusion really. I would like to see more Macs with anti-glare display. I couldn't understand Apple's move to glossy displays. In a stationary Mac I still expect a DVD-drive, but of better quality (mine has broken). I suspect the problem with too many lines of laptops is temporary. Once SSD prices drop a bit more and the next generation of processors become available, I would expect Apple to drop the legacy MacBooks Pro 13 and 15. Similarly for the iPad 2. That will leave them with 4 laptops, a Mac mini line, the iMac line, 2 iPads. And maybe a Mac Pro. Not so bad. The 21.5" model iMac is a crippled design. RAM is not upgradable by the user. You have to do a build to order at the time of purchase if you want more memory. The hard drive is a crippled 5,400 rpm laptop drive. It is ridiculous what Apple is doing. I don't care how thin my desktop computer is, I don't carry it around. When I look at my 2011 27", I don't see the sides, nor do I care how thin or thick it is. The new 27" model is not crippled as much as the 21.5. The 27 still has user accessible RAM slots and a desktop-class 7,200 RPM hard drive. Sounds like my original post at the beginning is true. I agree with the persons that are concerned about heat and the lack of user accessible RAM. However I am not that concerned about a lack of a optical drive. Since it is a desktop machine you can add your own external as you wish, such as a Blu-Ray drive that reads and writes everything else for around $100. My only issue with this is that Apple probably has not passed to the lowered cost of not having the drive to the consumer - just increased their profit. Is Apple becoming the new Microsoft? Can Tim Cook really fill Steve Job's shoes? These are questions that will be answered in a few years. My suggestion: If Tim Cook implodes, Apple should make Melissa Mayer an offer she can't refuse. One way or another, she is destined to be the next Steve Jobs. The point of an iMac is that it is one-piece. Adding a satellite optical drive returns clutter to the desktop. Moving all the external connections to the back of the machine is a dumb move too. I have the original model 27" iMac, and that necessitates a separate USB hub to plug and unplug the transitory devices (camera, iPod). Moving the SD card slot to the back is just stupid - that HAS to be a come-and-go device. Not a significant iMac update IMO. There seem to be negatives without significant positives. Having a slightly thinner desktop seems to offer no user advantage( as alluded to by the article ). The removal of a potentially useful optical drive saves Apple space and money but only reduces user options. I find it interesting that all Apple online store iMac sales are on hold waiting for the new models to arrive. I wanted to get your opinion on an upcoming purchase. I see three options for a low-end desktop solution. I normally use my mac for internet, Word, Excel. I don't need gaming capabilities. 1. A new iMac, probably the $1299 configuration plus a $70 Apple USB Superdrive. 2. A refurb iMac (Sandy Bridge processor with quad i7 core) and I would add RAM to make it 8 GB, price is about $1290 plus about $50 for the RAM. 3. A Mac Mini with the quad-core i7 ($899) plus a Viewsonic monitor (about $170) and an Apple USB Superdrive ($70). I already have a mouse and keyboard and even 2x4 GB RAM to upgrade it. The advantage of a new iMac seems limited. It seems it is between a Mac Mini and a refurb iMac. The speed of the Mac Mini seems to win. But the iMac has everything together and I get the benefit of having it be all Apple. Any advice on which you would choose? Any other factors I am missing? p.s. Thoughts on the advantages of adding a $250 Fusion Dr.? * Buy the Mac mini if cost is paramount - it will be a bit cheaper. * If you really think you'll use the optical drive a lot, get the refurbished iMac, since it will be nice not having an extra box on your desk for the SuperDrive. * If you want the Mac that will have the longest lifespan, get the new iMac. It will also likely have the best display of the three. I would encourage getting the Fusion Drive (or a flash option for the refurb, if available) since my experience with SSDs is that they are a huge and noticeable win. But it will cost more. When is Apple going to wake up and remember that it has a Mac Pro line? I am increasingly concerned about the directions the company is taking, and I completely agree with the comments here about thinness. Who cares if the new Mac is thinner than the old iMac? But folks will surely care if it's less reliable. Macworld is reporting that the iMac can now be ordered with straight flash storage, rather than just a normal hard disk or a combination Fusion drive.